On the set: Amy Shira Teitel shoots a "Pluto in a Minute" episode in a makeshift studio – an office – at the Johns Hopkins Applied Physics Laboratory. Wonder why the New Horizons spacecraft "phoned home" just hours after it flew past Pluto? Or how it took such spectacular images of the Pluto system, or how it’s going to send all of those pictures and other data back to Earth over the next year? If you have a minute, the New Horizons team has the answers – to these and many other questions about the first mission to Pluto. 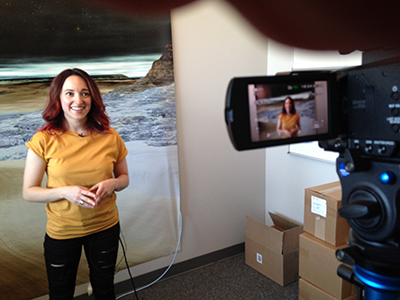 Our "Pluto in a Minute" webcast series, written, produced and hosted by Amy Shira Teitel, launched two weeks before New Horizons zipped past Pluto on July 14. These videos cover many aspects of the New Horizons mission, from spacecraft operations to scientific discoveries and the latest views of the Pluto system. Aside from being popular – nearly 150,000 views on YouTube alone – the series "is a great educational tool for anyone who wants to know about New Horizons," said mission Principal Investigator Alan Stern, Southwest Research Institute, Boulder, Colo. "It will also be a fantastic record of what the mission was up to during our busiest, most critical time – the Pluto flyby, as well as during the science data analysis phase." Teitel, a spaceflight historian and writer brought onto the New Horizons communications team for the flyby, shoots most of the videos in a makeshift studio – actually, an office – on the campus of the Johns Hopkins Applied Physics Laboratory in Laurel, Md. The New Horizons science team had gathered at APL, which manages the mission and operates the spacecraft, in the weeks surrounding the flyby; working closely with the scientists and other team mission members gave Teitel numerous ideas and ready sources for stories. But so did the public. Teitel watched the conversation about Pluto across social media channels and attended the flyby and Plutopalooza events, paying special attention to the recurring questions. "What might be second nature to someone in the space business can be completely foreign to even the science literate layperson," she says. "Interacting with my audience helps me answer the right questions." Episodes are available on YouTube, Facebook and the New Horizons mission website. Daily "Minutes" are scheduled through July, with less frequent updates expected through the rest of the year.